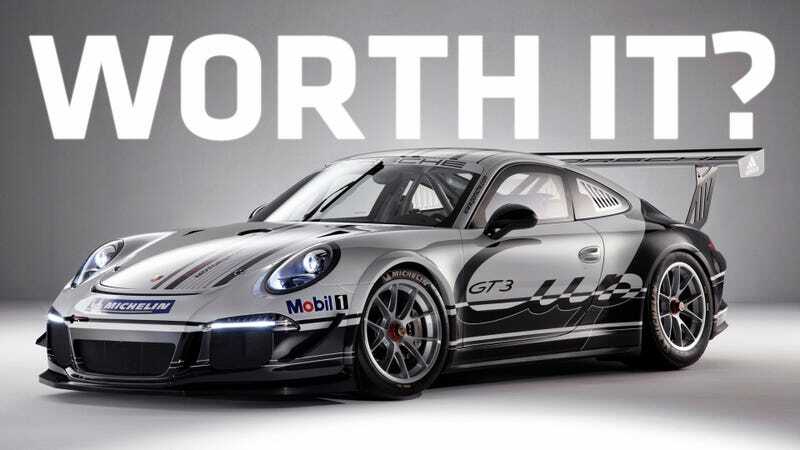 Is There A Better Customer Race Car Than The New Porsche 911 GT3 Cup? Porsche came out with the new 991 GT3 Cup car over the weekend. With flared fenders, more power, and a stripped interior it's impossible not to love, but at $234,273 (not including tax) is it the best car a gentleman racer can buy? The new car has the usual gains of more power (460 hp), better brakes, wider wheels, paddles on the steering wheel, and a stronger safety cage. Porsche has made a good business model on their cup cars. Axis of Oversteer points out that Porsche sold 2,400 of them at over $150,000, and that doesn't even take into account the massive market for spares. These days rich people with the racing bug are spoiled for choice. You can call up Ferrari and get yourself a 458 GT3 car, and the same could be said for Audi with the R8, Mercedes with the SLS AMG, or even BMW with the Z4. If you were a multimillionaire looking to leave your carbon-fiber golf clubs behind and go racing, which car would you choose?